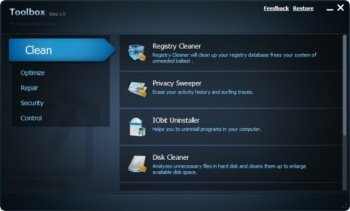 IObit Toolbox is free portable software that system administrators and computer geeks will take along to solve PC problems anytime and anywhere. With more than 20 dedicated tools, it allows you to display/diagnose PC information, enhance PC security, optimize PC performance and repairing PC problems. MORE FAKE REVIEWS......!!!! MORE GARBAGE FROM THIS FIRM...!!!! BEWARE..!!!!!!!!!!!!! REALLY...!!!! Portable,IObit toolbox requires 0 installation.I can take it along in any portable devices to solve PC problems. A definite keeper of this tool kit. A definite keeper of this useful tools collection. 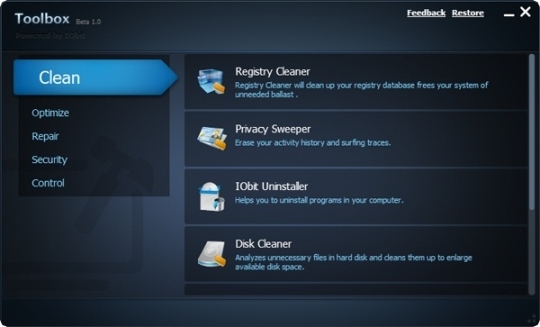 IObit Toolbox provides more than 20 tools for diagnosing and fixing PC problems anytime/anywhere. If you are traveling with your laptop and don't have access to tech support and (or if you just want a handy diagnostic toolbox to take on road trips), this collection is ideal. IObit toolbox requires 0 installation. I can take it along with you in any portable devices, like flash disk, to solve PC problems anytime and anywhere. Also it eats little room in the disk. Useful tools all in one package. Useful tools are all in one small package. Very nice and easy interface.